I have been craving it and since I have not made it in a long time I decided it was time to do it. My daughter loved dumping in all the ingredients in the food processor and watching it whirl around. I think her favorite part of it all (other than tasting the pre-frozen product) was seeing it begin to set up in the ice cream maker. 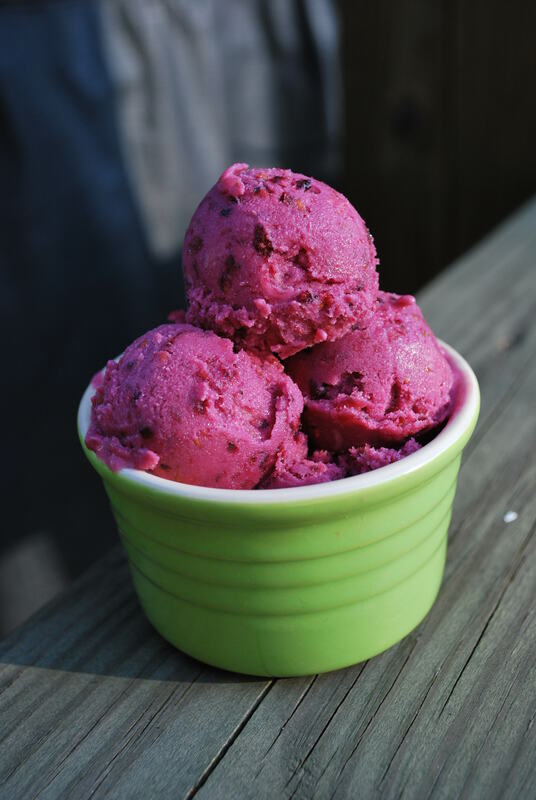 I have a Kitchen Aid freezer bowl attachment that I use to make ice cream like treats in. If you don’t have one no worries, just put it in a cake pan (9″x13″) in the freezer and scrape it occasionally until it is semi-firm in the center and set on the edges. I enjoy it drizzled with honey or chocolate sauce. Enjoy it however you like! Have a happy and safe St. Patrick’s day! This morning I had to get in another early start to exercise. Being a Thursday, it is a cardio day for me. I planned on getting out the door by myself since my husband is still on vacation. I tried so hard to get out but my little dog pushed his way out the door and was not letting me leave under any circumstances! So my little man and I went for a slow run/walk three-mile run. It was probably for the best that he slowed me down since my knee hurt from volleyball last night. We only had five people and coverage was thin. I dove instinctively for the ball (thankfully wearing knee pads) and did not even consider my bad knee which is the one I went down on. It’s not awful but sore today. So my workout was nice but chilly! Fourty degrees and windy. Dressed in my shorts and a thin jacket I was cold! I also have Reynaud’s so my fingers freeze if it is below 5o degrees. I forgot my gloves too! I came home and took a hot shower and ate a hot bowl of oatmeal. 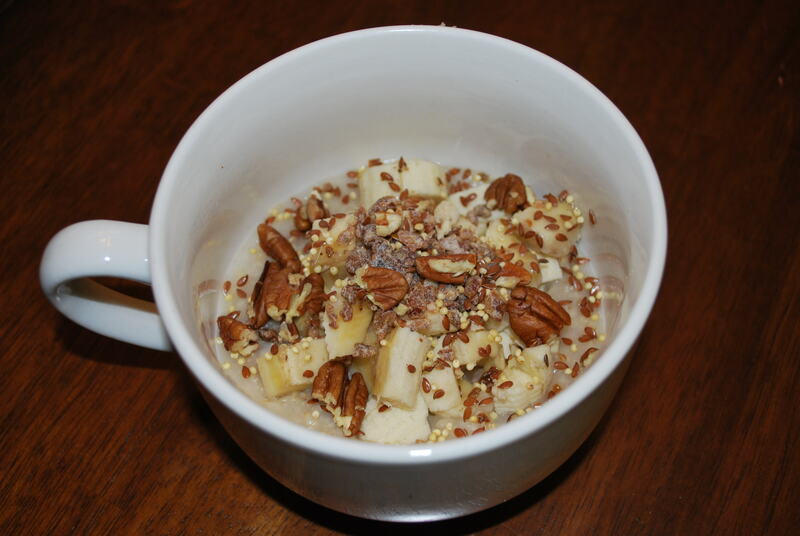 Oatmeal Today: Plain oats topped with banana chunks, chopped dates, pecans, millet and flax seeds. Now I had to get ready for the unpleasant part. My daughters three-year-old check-up. She is super sensitive when it comes to going to the doctor (we are due to try the dentist soon and I am not going to think about that yet!). We read books about it, play with her doctor kit, talk about check-ups and so on, but it never fails when it is time to go to the doctor it is a huge ordeal! When we hit the parking lot she starts crying and it comes and goes in bursts untill we leave. We finally finished up at the doctors (She is a healthy girl! I am so happy my husband was home to go with me. I did plan it that way. :)) and went for lunch. I did not plan on eating out so I did not have my camera. We were all hungry after the appointment since we had to wait 40+ minutes to get in to see the doctor. All that waiting just adds to her anxiety. So off to the coney that we like we went. I had a salmon burger with some sweet potato fries. I love that they do not salt the fries. I am not a salty person. 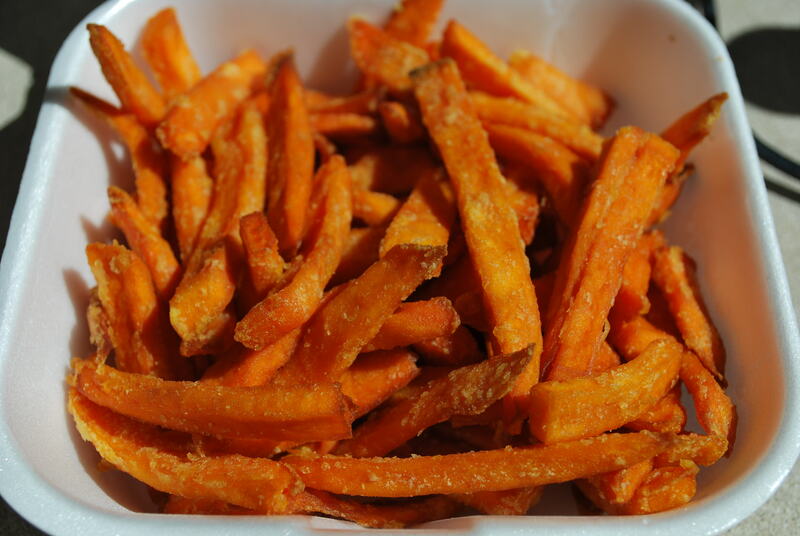 I don’t have a picture of the burger but here are the left over fries that came home with me. They are great re-heated in the convection/toaster oven! That’s my eats so far. I am looking for my mediterainan meal tonight! So far she seems to be artsy. The things she comes up with astounds me sometimes. We walked out of the mall on a very hot and muggy day. It was super humid and near 100 degrees. As soon as we stepped out of the shade into the sun she said “The sun. The sun cuts me and eats me.” What kind of two and a half (at the time) says stuff like that? I guess mine. Anyway, I had to get moving early. I did my Gabby Reece Group Circuit Workout 15. It was a good one as usual. I was also happy that I did the workout and was back up to my normal number of reps per minute. I am not sure what my deal was (maybe my Monday’s eating) last week but I felt completely awful and weak. I think I am almost back to normal again. 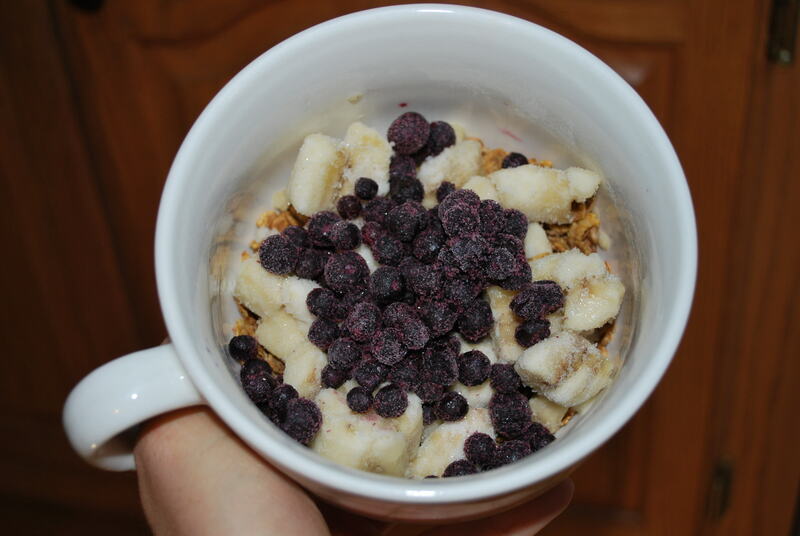 Uncle Sam (half original/half strawberry) cereal topped with frozen banana, frozen blueberries, and 50/50 mixture of unsweetened almond milk and skim milk. I love this combination. It freezes up and you have to chop it up with your spoon and it softens and makes like a soft serve ice cream with granola in it. So good! You will probably see this quite a bit lately. It’s my new thing. 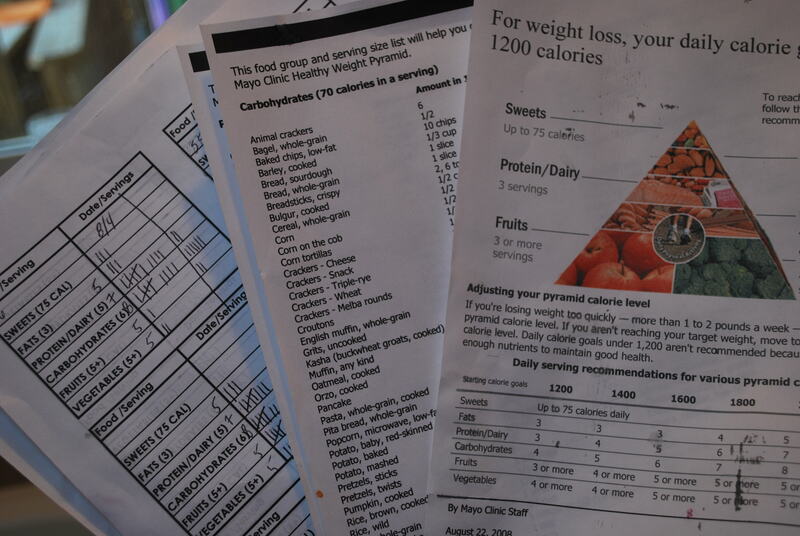 After breakfast I threw out my checklists. Ok threw out is an exaggeration it was more like fold in half and put it to the back of the cupboard. I am not using it anymore. I am working on intuitive eating to the fullest of my ability now. Lunch tested me. 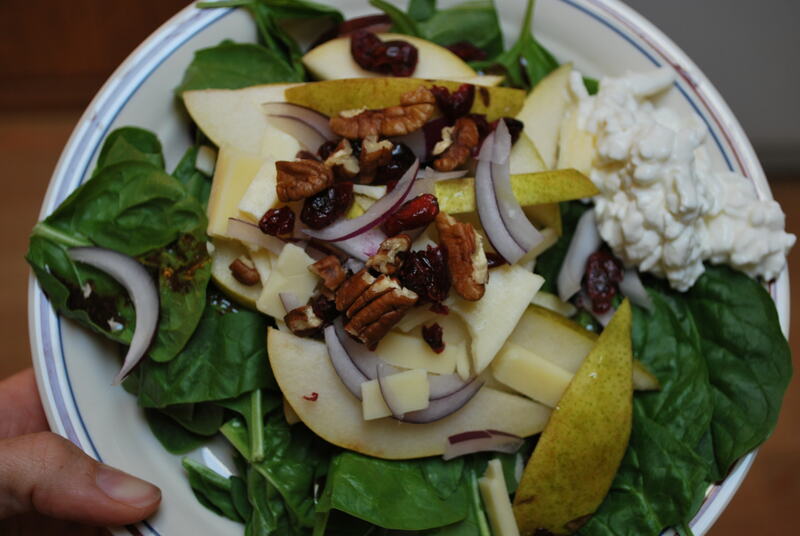 Salad-spinach, balsamic vinaigrette, pear slices, aged cheddar cheese, red onion, and dried cranberries! So good! I decided to plop a bit of cottage cheese on the side. 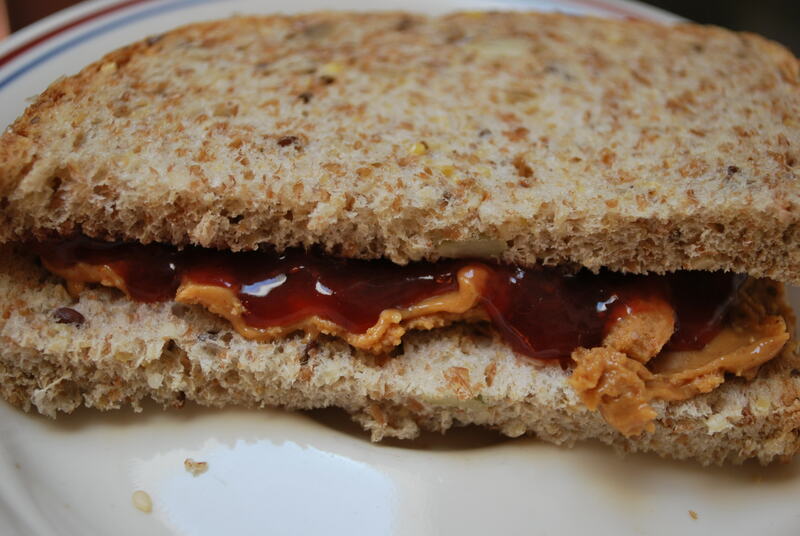 I also made half of a PB & J on sprouted bread. I hope you had a good morning and a good day too! A Sprouted Day and a Little Thief! 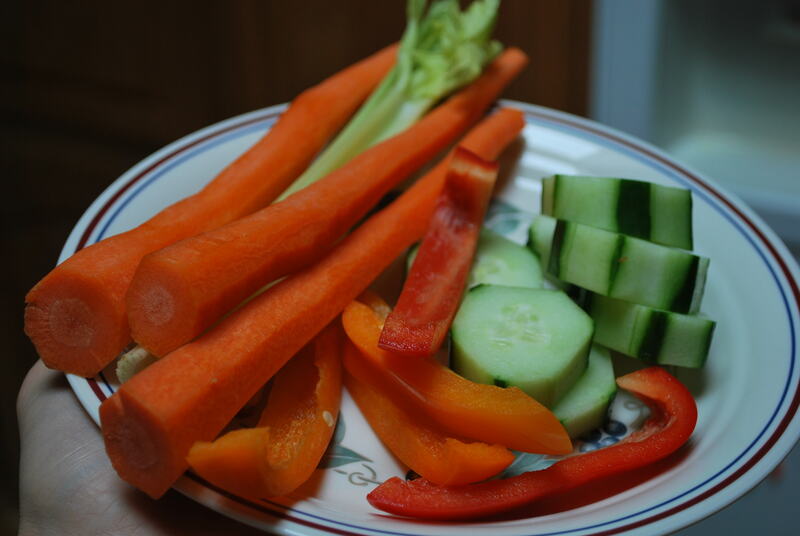 For a snack today I had some veggies. I also had a tablespoon of peanut butter on my plate in a measuring spoon, but when I went to get the camera and it was missing. 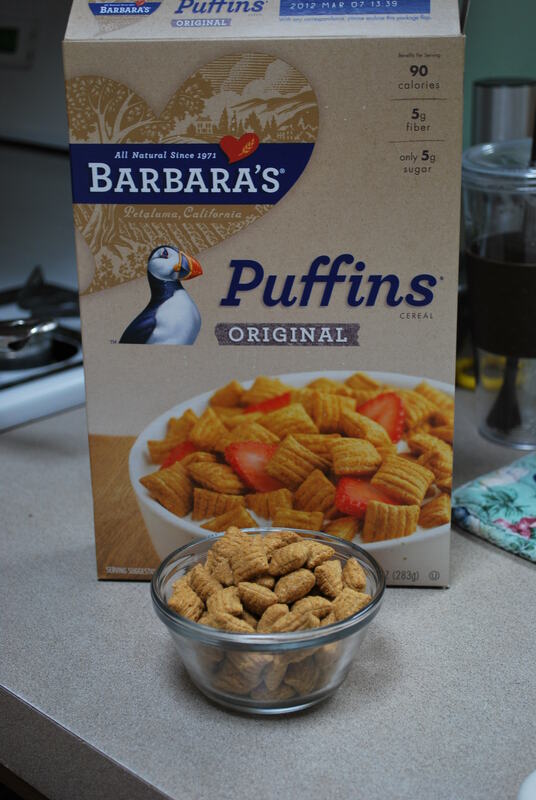 I felt like I needed some carbs so I finished off the last of my Puffins Original. It was good as usual. I like the peanut butter better, but that is no surprise. 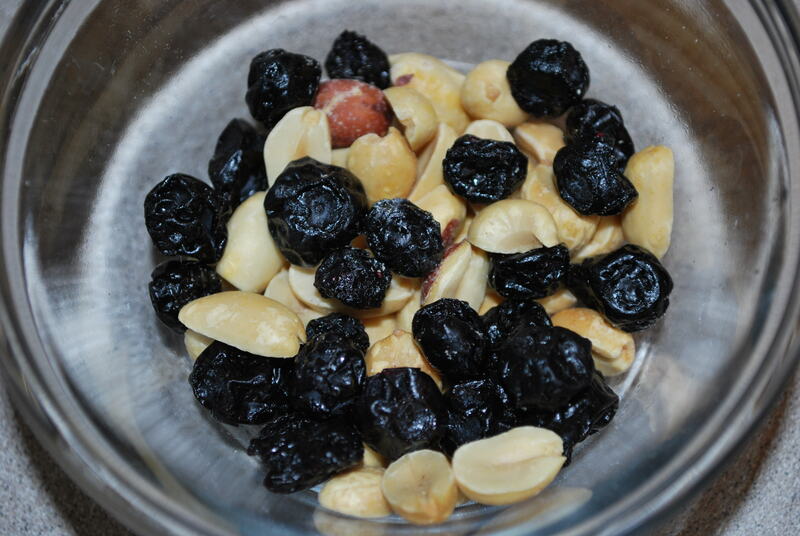 I like to eat it on occasion, dry as a snack. 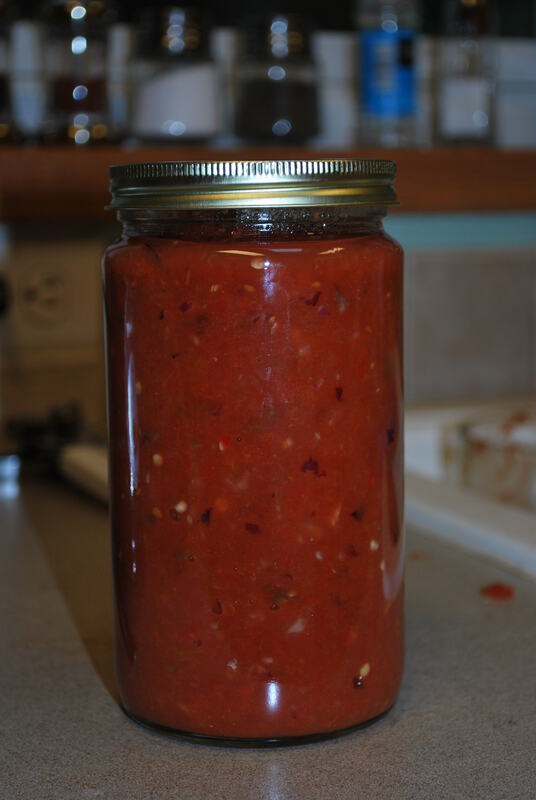 My daughter and I played with some of her toys for quite a while and I decided it was time to make my homemade salsa! I wanted it to chill a bit before I used it on my dinner. I made my dinner of sprouted tortillas (remember my sprouted bread for lunch?!) 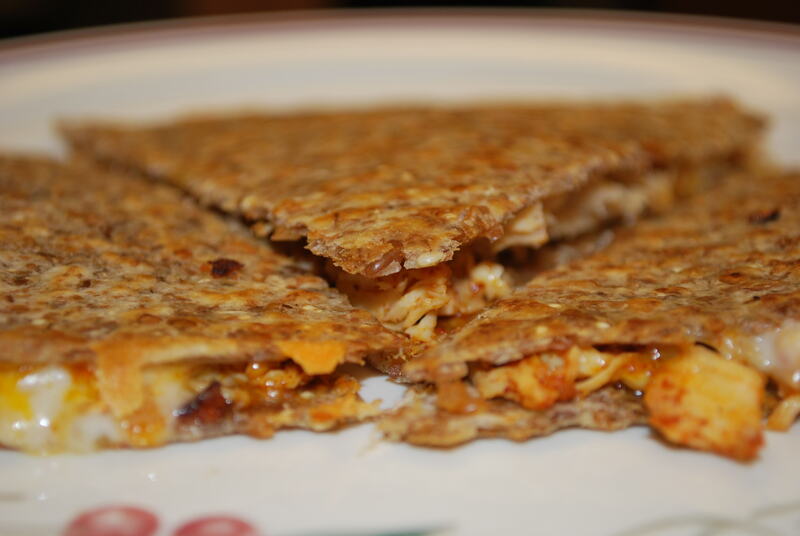 shredded chicken, cheddar, and Monterey jack cheese. It was the perfect quesadilla! 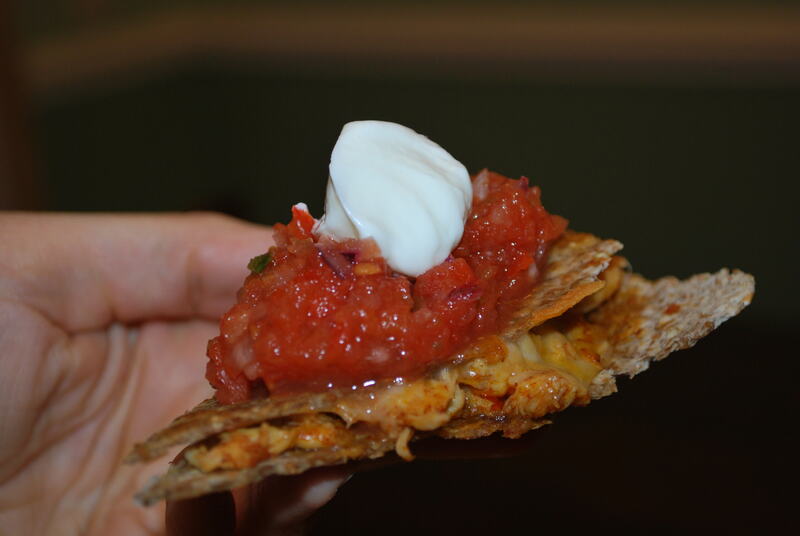 I topped it off with my homemade salsa and greek yogurt! It was what I was craving! The greek yogurt really made it! So that’s my eats for today. I am done for the night! I hope you had a great day and a good evening too! I got my run out-of-the-way this morning and had a small breakfast smoothie. It was no surprise that lunch came early. I guess I was still feeling like breakfast. I had a fried egg sandwich! It was so good! 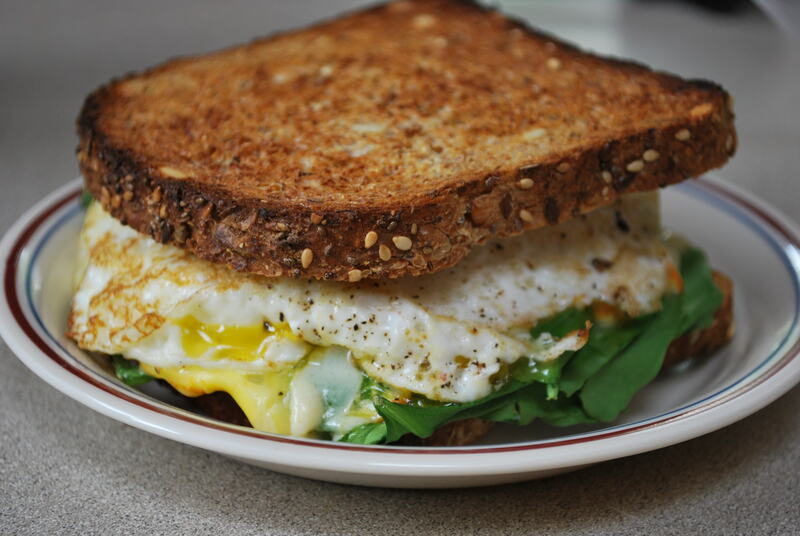 Egg, Muenster, spinach all on sprouted bread and toasted in my toaster oven! It does not get much better! 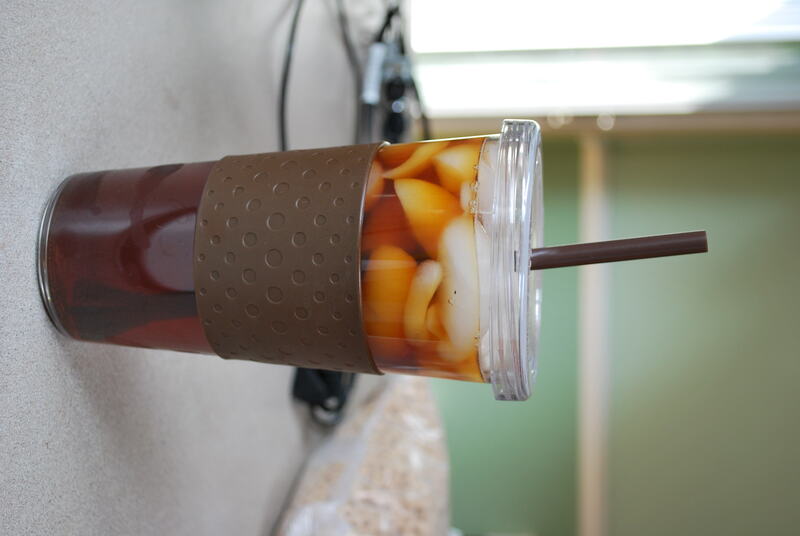 I had it with an iced coffee! Then my three-year old wanted one too! So I made her one. Don’t worry, it is only prune juice! She was thrilled to death with it! 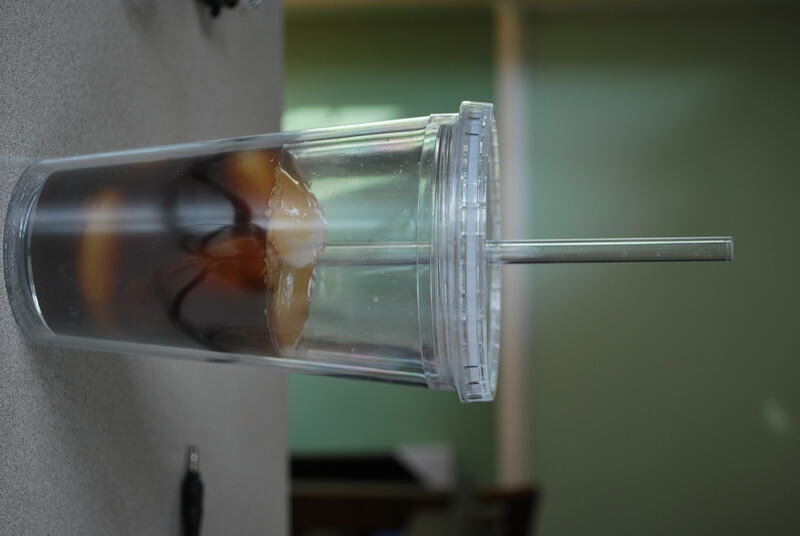 We sat together drinking our “iced coffees” and had toddler conversations. It was really fun! I hope you are having a great afternoon!